If you were watching The Walking Dead‘s midseason finale, you might have seen what’s actually the start of a viral campaign for the upcoming vampire TV show, The Strain. The new FX show is based on Guillermo del Toro’s The Strain Trilogy books, which he cowrote with Chuck Hogan and later turned into a comic book adaptation. It’s his take on the vampire tale and it’s dark, gory and twisted. You won’t find a sparkly blood sucker in the bunch. Del Toro first envisioned The Strain story as a television series, but he couldn’t find a buyer at the time, so an agent convinced him to initially turn it into a book. The rest is history. The “found footage” teaser for the show that aired on TV is now available online and it’s definitely meant to pique your interest, even though it doesn’t spell out exactly what it’s for. After the break, check out the viral clip and how it connects to the The Strain‘s story. In the book, many of these vampires have started infesting the tunnels underneath NYC. This in turn drives the subterranean rat population into the streets, hence, the rat swarms in the video. As for the “He is here” phrase that pops up quickly in the middle, in the book, this is a common vampire motto or chant that makes reference to their leader. Hopefully, this will be the first of many clips to help promote the show and reveal more of the characters and story. We’ll keep you in the loop as more videos pop up online. In the meantime, you can follow The Strain on its official Twitter, watch videos on its YouTube and add the show on Google +. The cast of The Strain includes Corey Stoll, Kevin Durand, Mia Maestro, Richard Sammel, Lauren Lee Smith, Sean Astin, Jonathan Hyde, Miguel Gomez, and John Hurt. The pilot episode was written by Guillermo del Toro and Chuck Hogan and was directed by del Toro as well. Carlton Cuse, who was executive producer and screenwriter on Lost, will be the showrunner. 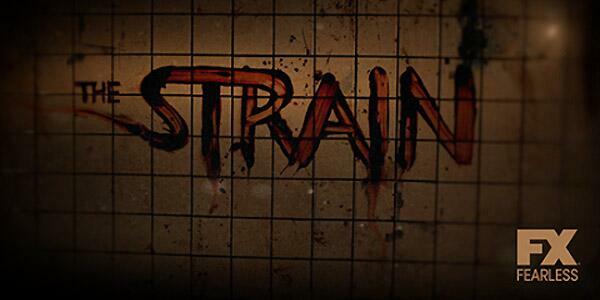 The Strain is set to premiere in July 2014.